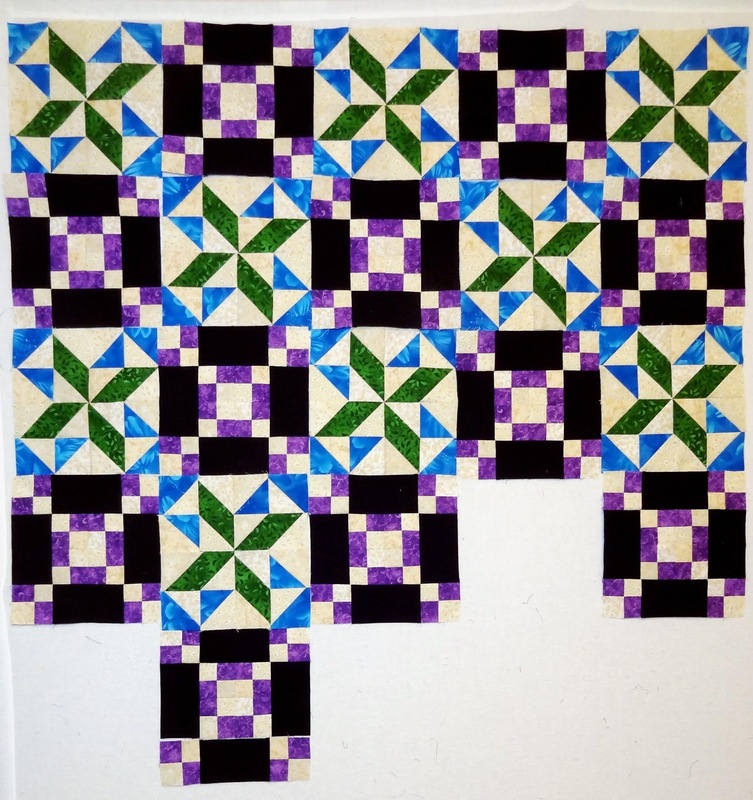 The quilt is really straight, the photo was taken at an odd angle as the quilt has gotten to big to photograph easily. Just one more beige border and it will be time to add the final dark green border. So I'm on track with my February One Monthly Goal. The Good Fortune blocks had to come down to put up the Angels flimsy. As the number of blocks on the design wall increase, the better I like it. I've decided to go for a 5 X 7 block layout. So I'm just over half way done with making the blocks. Lastly, I finished the 4th red Wild and Goosey block. 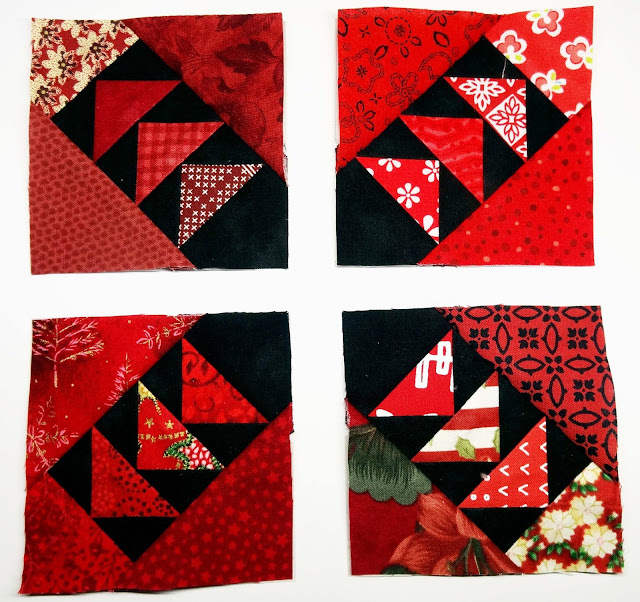 So I could lay them out to see how one block is going to look. I'm really happy with how these are working out. I need to get started on making some yellow ones this week. That's pretty much it from the sewing room. I am hoping to take my bonus day off this Friday, but with everything going on at work, that may not happen. Fingers crossed there. Glad you got some sewing time on the weekend... sure hope you get to have Friday off!! Beautiful projects, all of them. I really like the fabrics you chose for the second one (name flew right out of my head). Sometimes I wish I had a second design wall so I wouldn't have to take blocks for one project down in order to work on another! All of your projects are looking great! I love your Good Fortune blocks! 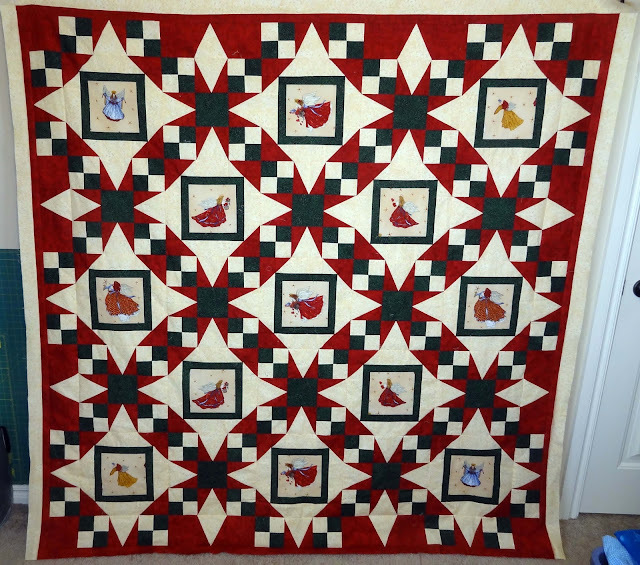 Christmas Angels is such a pretty quilt! I really like the piecing that gives the curved effect. Glad you're getting the chance to move this one along! You certainly had a productive weekend! Your projects are all looking fantastic! Here's hoping you get you bonus day off this week! Looks like you made a lot of progress! I love the Good Fortune. Good weekend's work! I love the Christmas Angels quilt. It turned out great! Looks like you are going to have two finishes in February. Look at you go!!! It was an awesome weekend for you!! LOVE the color in your Good Fortune!